Before I get into Freddy Deeb’s win I have to mention Sorel Mizzi’s performances in recent events; fresh off a 6th place in Monte Carlo two weeks ago, worth €143,000, Mizzi finished 2nd to Freddy Deeb in Paris adding another €120,000. This is in addition to capturing the East Coast Championship title at the Borgata in Atlantic City about a month ago, worth $170,000. Mizzi also finished 3rd in the 2010 Aussie Millions in January, and already has close to $1.5 million in winnings for 2010. Now if you can calculate expected value, I think you will find thats a plus. Ok, now on to Freddy Deeb! Deeb outlasted a small, but game, field of 24 players to win the WPT High-Roller event that earned the high-stakes poker pro €290,000. Only 4 players were paid due to the small field, with the lions share –61% of the total prize pool—going to the champion Deeb. Deeb has quietly amassed over $7 million in career tournament earnings in his career, despite playing in far fewer tournaments than full time tournament pros. 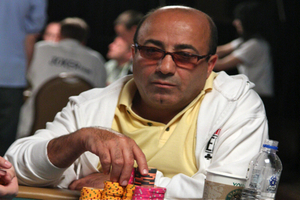 Deeb is also a regular in the high-stakes cash games around Las Vegas, making him a double threat in the poker world. This entry was posted on Tuesday, May 18th, 2010 at 4:00 pm and is filed under Poker News. You can follow any responses to this entry through the RSS 2.0 feed. You can leave a response, or trackback from your own site.